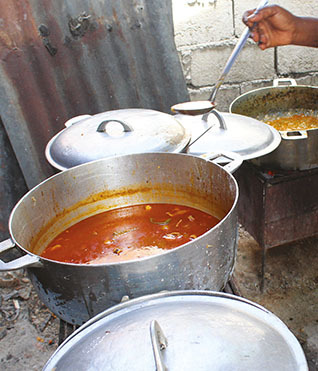 This special dish, the “soup of freedom,” is a symbol of communion and brotherhood, which was meant to cement our union for the progress of this island as our forefathers intended when they declared Haiti, an independent country on January 1, 1804,” says Haitian-Canadian journalist Jean-Claude Louis. Clean meat with lime or sour orange juice. Season with spices and marinate overnight or for at least 1 hour. Place meat in a pot and cover with water. Add oil and boil over high heat. Keep covered until the water has evaporated. Uncover, stir and add a little water occasionally as the meat gets to a nice brown colour. Stir in tomato paste. Remove meat and set aside pot for the vegetables. In a separate bowl, chop up the scallion and cut all the vegetables into bite-sized pieces. Add to a separate pot of boiling water. Cover and cook over high heat for about an hour. Reduce heat and add Scotch bonnet pepper. Once the squash is fully cooked, remove it from the pot. Use some of the cooking water to blend the squash into a puree. For the best flavour, pour the cooked vegetables, the squash puree and cooking liquid into the pot that was used to cook the meat. Add parsley, thyme, and broken spaghetti (or macaroni). Let it all cook, until tender.